It is amazing how much can change in the LCD TV industry in the blink of an eye. Less than a month ago we reviewed Panasonic’s largest LCD offering, the TC-32LX20. A month later its replacement, the Panasonic TC-32LX50, is shipping. With the TC-32LX50 you’ll have to blink your eyes a little faster not to miss a change in picture – the new Panasonic’s response time is 14ms, beating its predecessor by a quick 2 milliseconds. Along with improved response time the replacement model includes other subtle changes to the screen. Panasonic scaled back the feature lineup on the newer model. Major changes were made to the TC-32LX20’s controversial styling. We were universally impressed with both of the TVs. Picture, features, and value are all top-notch. We review the Panasonic TC-32LX20 LCD TV in-depth here, commenting on changes made in its replacement, the Panasonic TC-32LX50 LCD TV. Both TVs receive the same overall score, an impressive 95/100. The Panasonic TC-32LX20 and TC-32LX50 LCD TVs are 32-inch offerings in the VIERA line of flat panel displays. The Panasonic VIERA line is direct competition with the AQUOS line from Sharp, the LCD king. Panasonic, which is heavily invested in building plasma displays, hasn't fallen behind Sharp in the LCD race. Panasonic's highly styled TC-32LX20-era VIERA plasmas and LCDs look like TVs out of the future, while the latest generation of Panasonics, including the TC-32LX50, and Sharp LCD models are staid in appearance. Both manufacturers’ lines of displays are excellent and a consumer looking for a high-end HDTV built on LCD technology can't go wrong with either. The Panasonic TC-32LX20's screen is surrounded by a dark black frame, which is in turn surrounded by silver plastic. The Panasonic TC-32LX20 LCD Television has speakers on the sides, where as the TC-32LX50’s are located on the bottom. Panasonic reserves the space below the screen on the TC-32LX20 for a treasure trove of controls and inputs, including digital camera media card slots and composite RCA jacks. Panasonic lays a piece of tinted glass over the TC-32LX20’s LCD screen area that overlaps the speaker bezels along the sides. The extra glass layer creates a sense of depth. The design is by no means orthodox. Like it or not, the TC-32LX20's design catches your eye and stands out from Sharp and Sony's offerings. Depending on your taste you may or may not be sad to see that for the TC-32LX50 LCD TV Panasonic went with a black frame and bottom mounted silver speakers for a more orthodox look. We suspect the TC-32LX20’s radical design was Panasonic’s attempt to scream for attention as it carved out early market share in the LCD market; the TC-32LX50 is gracefully styled to let you concentrate exclusively on the TV’s picture, its best feature. The Panasonic TC-32LX20 and TC-32LX50 both performed exceptionally well. Panasonic made all the right component decisions when manufacturing the TC-32LX20 and TC-32LX50. Having a TV with high resolution and component inputs isn’t enough to ensure a good picture. A video signal’s life is just beginning when it hits the input jack. Computer circuitry, including scalars and reverse pull-down filter, take your DVD or cable signal and change it Extreme-Makeover-style before sending the signal information to the LCD panel. Manufacturing excellent circuitry and an excellent LCD panel is a tall order and Panasonic makes the cut. The images on Panasonic’s 32-inch LCDs are bright but the TVs also excel at reproducing blacks. Watching a HDTV documentary on locomotives we were able to see subtle details in jet-black cast iron trains. Panasonic reports a 500:1 contrast ratio for the TV. The Panasonic TC-32LX20 ships preset at its worst picture setting: vivid. Switching to cinema or standard results in more accurate colors and dims the backlight, which prolongs the life of the display. Backlight, picture, brightness, color, tint, sharpness, and color temperature can all be individually adjusted. Using standard as a starting point, we adjusted the backlight setting to 0, the contrast (Panasonic labels contrast as picture) to +25, the brightness to +5, and sharpness to -20. Setting the temperature to cool did not blue whites and made skin tones slightly more realistic. The TC-32LX50 adds an auto setting, which senses ambient light and adjusts the picture accordingly, ensuring optimal viewing while prolonging LCD bulb life. This is a feature we’ve enjoyed on the AQUOS line and Panasonic’s decision to include it on their new 32-inch LCD shows they’re going to be tenacious competition for LCD top dog Sharp. While watching Collateral we appreciated the detail in Tom Cruise's frosted hair, which we couldn't make out an adjacent Panasonic plasma display. Although dark scenes didn’t have the level of detail we’d expect from a plasma, for an LCD TV this television had excellent grayscale detail. Four aspect ratio settings are available: normal, just, zoom, and full. Zoom enlarged our 2.40:1 DVD source to fill the more of the 1280 x 768 pixel display without any cropping off the edges. Just stretches an image horizontally across the TC-32LX20/TC-32LX50 and applies aspect correction to the center of the image; full enlarges a 4:3 source without any aspect correction. For each setting the stretch and image location can be finely adjusted. The newer TC-32LX50 ups the resolution to 1366x768, closer to true 1080i. Both TVs include motion adaptive 3:2 pull-down filters to eliminate artifacts introduced using 480i sources. During off-axis viewing glare and color washout are non-existent inside of the center 120-degree area. Outside 120 degrees glare crops up and slight a washing-out of color begins. These effects don't become very noticeable or bothersome until you are viewing at the display's outer limit, 170 degrees. Watching a 32-inch LCD television you won't turn to run if you see Godzilla bouncing your way, but for viewing distances up to 10 feet, the TC-32LX20 and TC-32LX50 LCD televisions are plenty large; for viewing up to 15 feet their size is adequate. Panasonic lists a 16 ms response time on the TC-32LX20, we didn't observe any artifacts during on-screen movement so the newer TC-32LX50’s 14 ms response time shouldn’t pose any problems. Component Video and HDMI inputs provide all you need for outstanding video quality. The Panasonic TC-32LX20's illuminated remote control's ergonomics are second to none. Unfortunately Panasonic tried to improve on perfection (or maybe just save money) and the TC-32LX50 ships with a non-illuminated remote with fewer buttons. Navigating the remotes included with some of Panasonic's plasmas can be a two handed operation for those with petite hands. Both the TC-32LX20 and TC-32LX50's remotes are shaped to be easily grasped. The on-screen menu system on both TVs is not as attractive as those found on Plasma displays from Panasonic and other manufacturers, but text is clearly legible. Connecting any device to TC-32LX20 or TC-32LX50 is a breeze thanks to their many inputs. The LCD TVs can be connected to an antennae or cable source through a coaxial input jack. 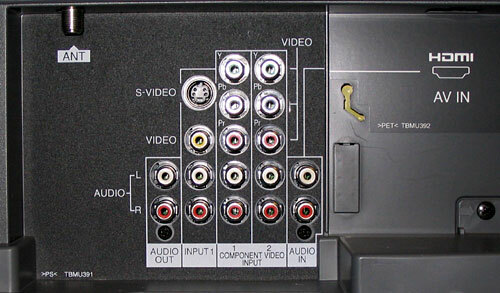 On the TC-32LX20 DVD players, satellite and cable boxes, and video game systems can be connected via two sets of rear inputs jacks: one dual composite/component and one dedicated component. The display also has a rear HDMI jack and RCA audio out jacks. Under a fold-down door below the screen are front-mounted composite inputs, a front headphone jack, and SD and PC card slots for viewing digital photos. The Panasonic TC-32LX50 dropped camera card slots in favor of an additional rear-mounted composite input. Since most cameras include adaptors for composite output this shouldn’t pose a problem. Users shouldn't spend too long searching through the box for the power cord, as this reviewer did. It arrives stowed under a removable panel on the back of the screen that neatly covers all the jacks and connected cables once you have the display set up. There's no way to directly connect a computer to this display, which has no DVI or VGA input. A DVI to HDMI connector could work with some video cards. Neither the TC-32LX20 nor TC-32LX50 include a built-in ATSC tuner or CableCARD slot. Unfortunately, Panasonic didn’t add either feature to its 1366x768-native TC-32LX50, which would have put it squarely in league with the Sharp AQUOS series. Many buyers will probably already have a cable or satellite receiver though and be happy to save $500 on the price of the latest AQUOS by buying the Panasonic TC-32LX20. Sound out of the four speakers is plentiful. Panasonic powers each channel's two speakers with 20 watts. Those people who will not use the LCD TV with a surround sound system, or occasionally watch the TV with their home theater sound system turned off, will appreciate how Panasonic didn't skimp on speaker or amplifier quality in either the TC-32LX20 or TC-32LX50. We found activating the simulated surround setting generally makes voices weaker. While the speaker wattage is impressive, either of the TVs’ overall 164-watt power consumption won't run up your electric bill. If you turn off the lights while you enjoy the show it might actually save a few dollars. In a silent room the florescent tube and electronics are barely audible when the TV is muted. The Panasonic TC-32LX20 is assembled in Japan. It is hefty at 62 lbs. Without the stand it is a shade over 22.5 inches tall, 5.5 inches deep, and 39.5 inches wide. With the stand it is about 26 inches tall and roughly 13 inches deep. The TC-32LX50 thankfully went on a diet and weighs 40 lbs. With the bottom-mounted speakers it also lost some girth, measuring just less than 32 inches wide. With the stand it is approximately 26 inches tall and a foot deep. Both TVs include stands. The TC-32LX20 and TC-32LX50 can be swiveled 20 degrees in either direction. Neither TV can be tilted on the stand. Perhaps the biggest change consumers will appreciate between the TC-32LX20 and TC-32LX50 is price. The cheaper remote and loss of digital camera media card slots on the TC-32LX50 are lamentable, but Panasonic is introducing the TC-32LX50 with an MSRP of $2295, about two hundred dollars cheaper than the street price of the TC-32LX20 a couple months ago. At around $2300 either of these LCDs are excellent HDTV purchases. You might want to shop for the best deal on either, or choose a model based on which design you prefer. While I don’t normally suggest buying a TV based on its form, when both models have their functionality and picture down so well weighing design into overall satisfaction is sensible. While dealers still have the TC-32LX20 in stock expect to find the TC-32LX50 selling at or near its MSRP. Both models are priced comparably or cheaper than similar-size displays from Sony, Samsung, and NEC. At $2,300 the TC-32LX20 and TC-32LX50 are excellent displays at an excellent prices from a first-tier manufacturer. The Panasonic TC-32LX20 and TC-32LX50 have the specs and extras many buyers will want: HDTV resolution, a forty-watt sound system, HDMI, and component inputs. There are no built-in ATSC receivers, but most cable and satellite customers have little use for a built-in tuner. Either of the quality Panasonic TC-32LX20 and TC-32LX50 LCD televisions makes for a sleek home theater centerpiece or living room television.